Is Thermoplastic or Fluropolymer lined pipe required in the material handling and process of your products? Are you wasting extra time and money on sections of lined pipe to try to get the correct fit? The perfect alternative is to place a pipe spacer in between the two flange fittings to get the correct fit, including compensating for angular unions! The 2 main types of pipe spacers are Ring spacers (without bolt holes) and Full Face spacers (with bolt holes). Both types are manufactured by 4B Plastics and are available as standard, single and double tapered, tapered for butterfly valves, orifice tap, and armored.  Because 4B Plastics molds its own stock materials, we are not limited to stock thickness. We offer both Ring and Full Face spacers in pipe sizes 1-24″ and thicknesses from 1/16″ to 12″ depending on pipe size. When you need PTFE, Kynar, HDPE, or Polypropylene spacers to fill a space between two flange fittings, 4B Plastics Express Part Service can machine a stock or custom size and shape pipe spacer that provides a quick and secure connection. 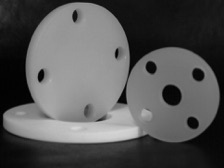 The most common materials used for full face spacers are PTFE, Kynar, HDPE, and Polypropylene. 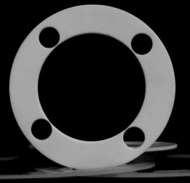 These full face spacers are ordered by pipe size from 1″ to 24″. Thickness of these spacers can be made per customers needs up to 12″. 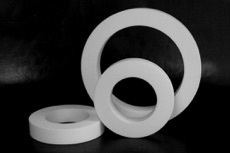 Ring spacers are generally made out of PTFE, Kynar and Polypropylene material. 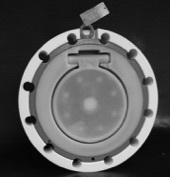 They are normally ordered by pipe size from 1″ to 24″. Thickness of these spacers can be made per customers needs all the way up to 12″. Does your system use INOX Valves in your operation? If so, there wil come a time when you are in need of INOX Yarway Seats. We can produce a number of different size seats to match your plant needs. Contact us below to learn more. If you need gaskets in many different sizes, you've come to the right place. We can build exactly what you need and these custom orders are backed with quality craftsmanship and super fast turn around time. Give us a call. In some cases, you may be in need of a more robust spacer with an outside armored coating. We manufacture these armored spacers to your project specifications and can alter the thickness as needed. One of the strengths of 4B Plastics is that our engineers are very experienced in creating customized products. We work with you to understand how you will be using the spacers and then design and manufacture a product to fit your needs. 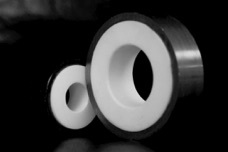 The team at 4B Plastics can manufacture Teflon PTFE Gaskets exactly to your specifications and can generally turn them around quickly so that your operation can get back up and running as soon as possible. It could be that your project requires a different solution with different materials. At 4B, we also manufacture Polypropylene annular gaskets and can also build these to match your needs and project specifications. Give us a call to learn more.